As you are making your plans to come to WASHTO 2018, I hope you’ll consider coming early so you can take part in one of the pre-conference events. The first one I’d like to highlight is the Deadwood Excursion. Deadwood is in the northern Black Hills and about 45 minutes from Rapid City. Gold was discovered in the southern Black Hills in 1874 and that set off one of the great gold rushes in America. In 1876, miners moved into the northern Black Hills. They came across a gulch full of dead trees and a creek full of gold. That’s the beginning of the Deadwood saga. The tiny gold camp erupted into a town practically overnight. The folks that lived in Deadwood lived by their own rules. It was a magnet for outlaws, gamblers and gunslingers, as well as those seeking their fortune in gold. Wild Bill Hickok was one of those men who came looking for his fortune. Just a few weeks after arriving, he was gunned down while holding a poker hand of aces and eights – forever known as the Dead Man’s Hand. Deadwood was filled with colorful characters. Calamity Jane made a name for herself in these parts and is buried next to Hickok at Mount Moriah Cemetery. Other legends, like Potato Creek Johnny, Seth Bullock and Al Swearengen created their own legacies in Deadwood. Deadwood has survived three major fires and numerous economic hardships which almost made it just another Old West ghost town. In 1989, limited-wage gambling was legalized and Deadwood was reborn. Today, Deadwood is a booming town again. It has modern-day casinos, museums, artifacts, tours, shopping, spas, unique dining experiences and so much more to see. Check out www.deadwood.com to learn more about what you can do in Deadwood. 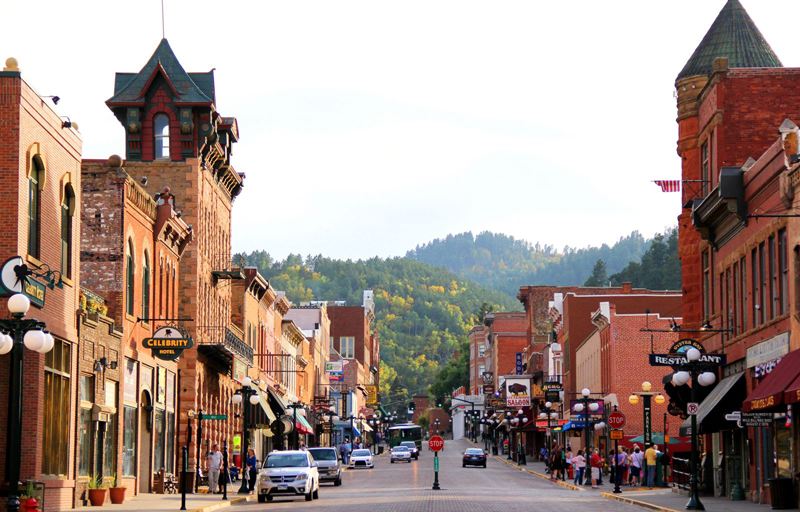 Deadwood has something to offer for people of all ages. It’s a family friendly adventure. If you decide to go on the Deadwood excursion, we’ll bus you to Deadwood and then you’ll be on your own to explore the city. And we’ll get you back to Rapid City so you don’t miss the opening night reception. There will be staff traveling with you to assist you. Deadwood has a trolley that you’ll ride for free to get around the community. It’s your opportunity to see this historic community and experience the old west. If Deadwood doesn’t interest you, we have a golf tournament and biking on Sunday. I’ll talk more about that in a later blog. Hope you’ll join us on Sunday for great fun before the conference starts.